Fresh meat. Fresh Veg. Clean Ingredients. Nothing artificial and no added sugar… Gorgeous! 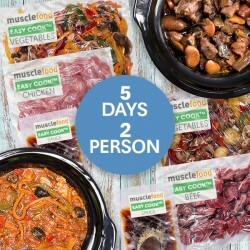 All you have to do is tip the bag into a slow cooker and cook on low for 6-8 hours, or high for 3-4 or pop into a casserole dish and bake for 2 to 4 hours for a simple, clean, lean and healthy meal that's beautifully tender.